Re-grout every 3-4 years?! Wow! With either an engineering or craftsmanship that requires that amount of periodic rework of major building components, most houses would be constantly under renovation! We just finished putting down Allure in 3/4 of our rental. Highly, highly recommend it from the standpoint of ease of installation. I've put down almost every type of flooring out there, with few exceptions. This was, by far, the easiest. We'll see how it holds up. @Carl Thompson I'll have to agree that real tile or hardwood is a great way to go. You can also put in colored concrete that looks like marble or tile. You can also put a sealer and/or clear finish over the grout so that you do not have to replace it. If it even starts to look questionable just put another clear coat over it or re-seal it. We don't need to regrout our jobs. Just make sure that you install the grout the right way the first time. @David Coleman I would have to check that "water proof" flooring over time, if it has any type of composite material under the laminate - I don't believe it will last at all. Look at your the warranty Jacob Anderson check it out . Thanks for your post. 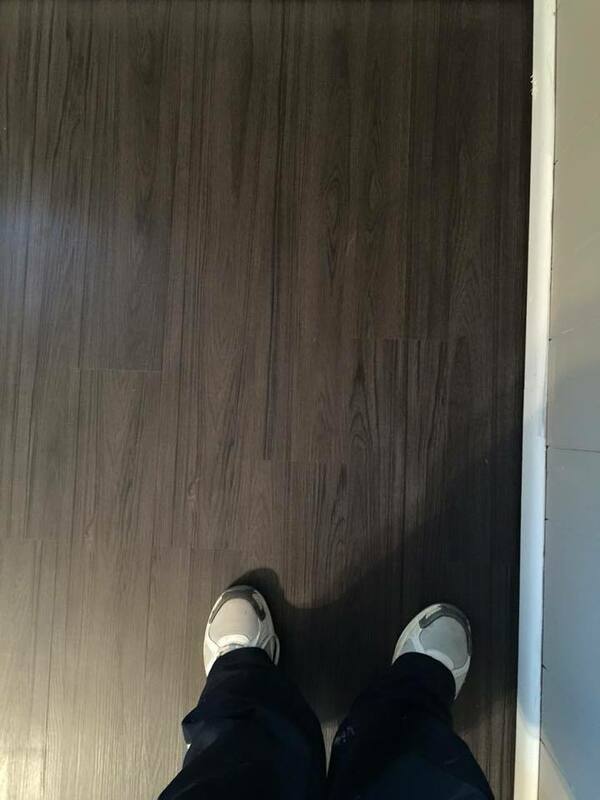 2 questions for you on the engineered hardwood. Do you prefer the click together or the float type for long term use and the possibility of replacing any damaged boards in the future? Also, I've seen at Lumber Liquidators that there are thickness differences of the actual top layer of real hardwood on the engineered product, are there any concerns using the thinner layered ones? The specifications don't mention the actual real wood thickness, just overall thickness of the plank but I could see noticeable differences in the real wood depth. real hardwood is horrible, mine is constantly scratched by tenants. I'd go for the engineered wood and its better if it gets wet and much better against scratching. I had small leaks in kitchen and it ruined a lot of my hardwood and it costs quite a bit to repair. Flooring guy I trust said engineered wood is better when it gets wet. Do now I am in a dilemma as I have carpet in the bedrooms... Should I replace with matching hardwood or replace the carpet? They're small bedrooms so cost wont be too high. I'm not worried about water leaks in bedrooms but scratches are always an issue. Any recommendations? I was very interested in installing TrafficMaster Allure Ultra Vinyl Plank Flooring in my mom's late 1940's bungalow house (raised) in Orange County to prepare it for rental. That is until I read in it's specks that it should be installed in climate controlled environments. As there is no A/C in the house I emailed the manufacturer and they responded room temps need to stay 45-85 degrees to keep the warranty. Mom's house gets to over 95 in the summer moths. Has anyone installed this product in a warm house? If so, how did it hold up? I am installing Allure Ultra over concrete in a basement in Utah. I am concerned that it will feel cold during winter, and am considering providing underlayment. Has anybody used it with an underlayment in a colder climate like Utah? If yes, which did you use? What were the results? Also has anybody used it over a not 100% leveled concrete basement floor? I have a very minor crack and based on the iPhone tool it's only a 1 degree change. I would check with the manufacturer and see what tolerance they allow to still consider it a 'level' floor. I had some spots that were not totally level and I just stuck down some thin pieces of cardboard that did the trick. I can't really speak about underlayment because the product I used had underlayment already attached. I would think having underlayment would help, but will likely still be cold in the winter. We did the LVT tile on cement floor was awesome, wood plank look, also did a huge area behind a bar with the 16x16 sq marble look, glued it down, very nice look. got it at menards. good price. good warranty and reviews. You can use it on stairs just get the rubber edge or metal edge to go on the lip of the step, we found the good rubber edge at flooring supply to the trade warehouse. I vote LVT tile glue it down. Sorry !!! Correction,, it was the engineered plank flooring that warped, if it got water damaged,,I stand corrected !! LVT would wear the best but of course it depends on what you intend top get as rent. If you want a ceramic or stone look there are some great looking products in the 3mm to 4mm range that are groutable. I usually prefer one with a rounded edge compared to a pressed bevel; easier to grout IMHO. If you are looking at a main floor I'd suggest a 4mm click lock not an EVP or WPC; while these are good products they are new in our industry. Use a thin dense underlay on upper floors that is warrantied for use with click lock products. 3mm may separate if the maker is using an older locking system. Glue down would be my preferred installation but not a pressure sensitive. Use a glue that cures to a hard set so moisture and temperature has less of an effect regarding the subfloor. You really need a pro to use that glue but it's well worth it. Also don't use luan ESPECIALLY INTERIOR GRADE. 1/4" APA approved plywood is best. If you insist, use EXTERIOR grade luan, smooth one side, exterior grades using moisture resistant adhesives. but I still don't recommend them. I am having TARK­ETT flooring layed down tomorrow. It will be the entire upstairs to include bedrooms. I'll let you know how it looks. Big Thumbs Up for Allure! Is this the inter-lock style or the sticky style? Also what color is it? Love it! Thank you! @Kristen Brooks -- yes, the snap together, inter-locking style. I'd never used the stick-down. The color was Clear Cherry. I like real wood if you can afford it. You can get it discounted online if you search and install is not much more that vinyl planking. I am usually around $4.50-$5/sqft for installed pre-finished wood floors (I get quotes for $4-5/sqft installed for vinyl). I run it in the living room, dining room and beds. It will far outlast the vinyl product. I have real wood floors in my places and haven't had to re-sand them in over 9 years even with frequent move outs. Curious what y'alls thoughts are about refinishing hardwoods vs LVP in a low end rental. This is a 4 bed 2 bath with existing hardwoods in living and bedrooms. Has anyone used the TrafficMaster Allure (Grip Strip Type) in houses with stand up hot water radiators? With radiators getting up well over 100 deg in the winter it seems possible that the adhesive in that local area may not hold up well. The same goes for near un-insulated walls. I suppose a solution could be radiator covers could be used to provide some insulation. Strongly considering between vinyl plank and wood look tile. Any updated thoughts? Also for vinyl do you all prefer glue or interlocking? I haven't made any flooring changes lately, but next time I do I plan to go with interlocking vinyl plank. Tile is too easy to crack/break if a tenant drops something on it and I don't care for the glue down planks, but that is just me.